Cobb is a classic American salad and is made with any chopped meat or vegetables. Ham, turkey or chicken are typical, but crispy chorizo takes it up a notch. 1. In a frying pan, sear the chorizo slices over a medium-low heat for 5-7 minutes, until crisp and the fat is released; drain well on kitchen paper. Meanwhile, in a small bowl, whisk together the dressing ingredients and season. 2. Halve the cherry tomatoes. 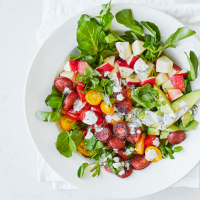 On a serving platter or plates, loosely arrange the chorizo, tomatoes, apple and avocado in sections, scattering the watercress throughout. Serve with the dressing drizzled over the top.